Bid for your favourite Items on the Ebay site or Email me direct with your requirements. When you wish to bid for any item on Ebay you must first go through a simple registration process to establish your buying and selling profile. You can bid for anything, anywhere in the world and pay securely through PayPal or Cash - Cheques etc. Click the picture to go straight to the Ebay site and sign up - you will enjoy! FREE Ebay Tips This is an e-book regularly sold on the net for upwards of £5.00. here you can download it free - lots of information to help you buy or sell successfully on Ebay. Visiting a Car Boot Sale at Hope in the glorious Peak District, I spotted a small pile of football programmes which looked interesting. They were a few Man Utd's and Liverpool's which were reasonably new but what caught my eye were six older ones from various clubs. When I say older they ranged from a Halifax Town one from 1949 to a couple of mid fifties Rangers ones in not too brilliant condition. I thought these may be worth a punt so I gingerly enquired "how much for these six?" I nearly fell over when the guy said 30p mate. So I handed over £1.80 and he said "nooooo, 30p for the six, they're 5p each!" Oh boy, this was a result no doubt so as soon as I got home I decided to list a couple on Ebay. 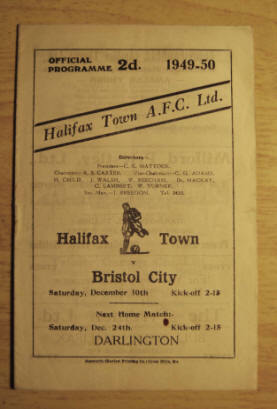 The Halifax Town v Bristol City was a strange one. I read the notes inside and it was a friendly because they were both knocked out of the cup in the first round. Both were division three clubs, Halifax from div. 3 North and Bristol from div. 3 South so I advertised it and sat back to see how it fared. On a 5 day auction it crept up to just over £23 with a few hours to go. I thought this was a tad over value but when it finished at £139.68 I was stunned. It's a case of if two people want it badly enough, they will go to the limit to obtain it, and in this case they did. Thankfully a good percentage of my sales go to The Christie Cancer Hospital in Manchester so maybe I didn't feel too guilty in over profiting this time. 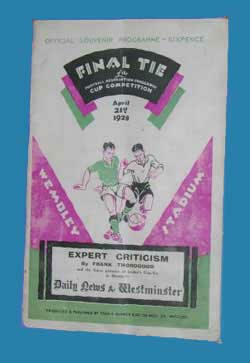 Description : Match programme in very good condition from the FA Cup Final played on April 21st 1928. The programme is 28 pages and has no writing or otherwise. Cover price was 6d and there are adverts for Sunripe cigarettes, Bovril, His Masteres Voice amongst others. This programme will be a very good aquisition for any collector and has been in my collection for over 16 years. As I've said many times before there were large amounts of these programmes sold on the day and a good few will still be tucked away in "grandads" cupboard. If you are in the market for making a few bob then ask the old boy if his dad went to this game, it may just be worth your while. It's essential you check the sellers feedback, also the items the seller generally sells as we are talking serious money here. As a matter of interest I checked both the sellers and buyers feedback and like my own they are both top class which is as good as it gets. Manchester United are not a club I admire, me being a blue mooner but I do appreciate the fact that I can make a few bob off their fans. According to popular belief United supporters come from far and wide and this is backed up by my Ebay sales. As yet I haven't posted any to Manchester, indeed I think Yorkshire is the nearest. I do have a couple of regular buyers in Thailand and Hong Kong who buy shirts and programmes. One programme was a bit of a surprise, I bought about 300 United progs from Grey Mare Lane Market in Gorton (Manchester) for £20.00. I have sold 8 which covered my outlay and then this two page issue, a friendly against Hull in Dec 72 netted me a cool £18.56 to a buyer in Scarborough. This was obviously a hard to find issue which are always likely to raise the ante. 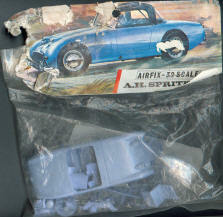 This Airfix plastic 1/32 scale model kit has been wasting it's time away in my study for over 30 years so I thought it was about time that I let someone have the benefit of it. One Sunday evening there was an Austin Healey Sprite exactly the same as this one parked outside the leisure centre in New Mills, my home town. I was tempted to offer it to the owner but when I saw a young girl of about 20 get in it I decided she would probably think I was some sort of pervy so I gave it a miss. However hopefully an enthusiast who will appreciate it has bought it, especially as he won a well fought auction with his winning bid of £15.02. Another example of niche products, I think I paid about 1s 6d when I bought it with the intention of converting it into a Scalextric car. I bought a Vauxhall Viva at the same time and converted that, perhaps I should have held on to it. 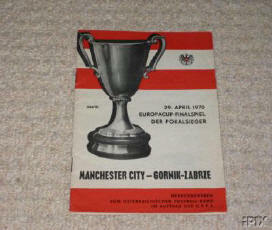 The most sought after European Final programme the very rare Man City v Gornik Zabre Cup Winners Cup Final. This doesn't come up very often as there weren't that many sold. On a dreadful wet and windy evening many were ruined and discarded. However there are quite a few about tucked away in cupboards and drawers in Manchester. It bugs me that this is the only major Final of City's I have missed since 1955 and would love a copy to add to my collection. I do have Man Uniteds Final Prog v Benfica at Wembley if anyone out there wants to swap. Now that was a bargain - one that convinced me to hold on to my own old footy rattle that graced the open end at Maine Road during the fifties. A while ago I decided to get some decent quality Rolling Stones Music to replace the old vinyl one's I own at present, but I don't want to pay for it. Well there are no free lunches, or so it is said. I spotted an excellent copy of 'The best of the Rolling Stones - Jump Back 71- 93' CD in a local shop costing £2.99 so I purchased it. The first job was to turn it into MP3 files of a good quality, 160Kbps is fine, using EasyCD Creator. I can then burn them back onto CD and have a copy for my computer. A visit to http://www.cdcovers.cc/covers.php (sadly they had to remove the audio section - use google to find another - UPDATE.... a cover request section is now available on cdcovers, quite useful) to download the covers and label and drop a copy of them into the mp3 file ready to make my new covers with EasyCD Creator label maker and Bob's your uncle. Now place the original CD on Ebay with a starting price of £3.00 and any higher bids puts you in profit giving you free music or better. 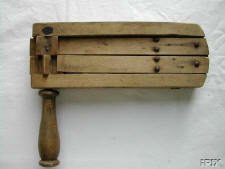 AUCTION ENDED - The auction ended with a good profit, final price £6.50. There were 9 bids with a late flurry on the last day but, yet again a last minute raid took it. So I end up with a good copy and £3.50 profit plus my money back to buy another one on Monday. This is what Ebay is all about, fair trade and fun. Copyright © Get Your Kits Out 2005 - All Rights Reserved - Enter at your own risk - Be brave, be patient but don't be stupid, just be thrifty.